Autodromo Hermanos Rodriguez is a 2.518-mile road course located approximately 15 minutes from the center of Mexico City. The original Autodromo Hermanos Rodriguez track was built in 1963 for Formula One events. That circuit raced at the facility from 1963 to 1970, and then returned to race there from 1986 through 1992. Racing has a rich tradition in Mexico. CART first raced at the facility in 2002. The three-day total attendance for the trackýs 2003 CART event was an astounding 402,413, with a crowd of 221,011 on race day. In June 1950, NASCAR Founder Bill France Sr. teamed with Curtis Turner to drive in the first Mexican Road Race. The 2,178 mile race was run from El Paso, Texas, across Mexico to Guatemala. Others participating in the event from the world of NASCAR included Bob and Fonty Flock, Raymond Parks and Red Byron. Bristol, one of the shortest tracks on the Nextel Cup circuit, has the highest banking, making for an appealing combination for driver and spectator alike. Added to the schedule in 1961 and resurfaced from asphalt to concrete in 1992, Bristol's attendance has increased from 18,000 to well over 160,000 with the reconstruction of the speedway's backstretch. 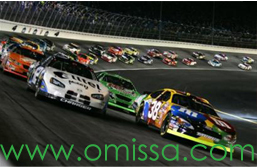 Situated on the site of the former Kaiser Steel mill approximately 40 miles east of Los Angeles, California Speedway is a great place to watch a race and experience the thrills of NASCAR. It is one of the premier auto racing venues in the country, hosting six major racing weekends, which includes the largest attended sporting event in the state. Chicagoland Speedway, which held Nextel Cup and Busch Series events for the first time in 2001, includes grandstand seating for 75,000 spectators, 37 luxury suites, on-site parking and camping areas and reserved long-term parking areas for recreational vehicles in the infield adjacent to the second and third turns. Every driver who has strapped on a helmet and climbed behind the steering wheel has wanted to win at Darlington because the toughest is most desirable. For those few select drivers who have won races at the granddaddy of superspeedways, there is a priceless satisfaction in knowing they've conquered the unique egg-shaped oval nicknamed "Too Tough To Tame." Since 1959, Daytona International Speedway has hosted the Daytona 500, now the culmination of a two-week festival of speed known as Speedweeks. In early July, the track hosts the night-time running of the Pepsi 400. In addition to Busch Series and Craftsman Truck events, the track also hosts the sports-car Rolex 24 at Daytona, and motorcycle and karting events. With a brand of racing that is as intimate as it is intense, there's no wonder why people continue to flock to "The Monster Mile." Dover, with seating for more than 140,000, is one of the most popular race destinations in the Northeast and hosts some of the biggest crowds to see a sporting event between New York and North Carolina.